APPLICATIONS: EPDM coverstrip is a heavy duty, very strong, EPDM faced seam cover and repair tape. Apply over seams, cuts, overlaps, trim and repair areas to repair, reinforce and seal. It adds long-term integrity and strength to these areas. The fully-cured state of the EPDM Cover Strip membrane makes it super durable, long lasting, and able to handle expansion and contraction loads without weakening. This formula also allows the Cover Strip to resist tearing, flex cracking, abrasion and other forms of deterioration caused by temperature extremes, sunlight, precipitation and all forms of normal weathering. DESCRIPTION: Peel & Stick Cured Coverstrip is a nominal 60-mil (1.52 mm) thick cured EPDM membrane with a nominal 35-mil (0.89 mm) thick fully cured, non-staining, with a synthetic rubber peel and stick bonding adhesive on the bottom. WeatherBond EPDM Peel & Stick Cover Strip is also available in 9" and 12" widths in black and white colors. Clean and Prime surfaces (use EPDM primer). Peel off protective coversheet, place adhesive side onto roofing surface. EternaBond RoofSeal WHITE Waterproofing / Roofing Repair Tape, 12 in. x 50 feet. Price/Roll. 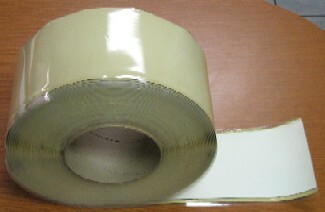 WHITE EPDM Coverstrip Seam Cover Tape with Butyl Rubber Peel and Stick Adhesive. LionGUARD Brand, Made in USA. 12-inch Wide X 100 Foot Roll. Price/Roll. WHITE EPDM Coverstrip Seam Cover Tape with Butyl Rubber Peel and Stick Adhesive. LionGUARD Brand, Made in USA. 12-inch Wide X 50 Foot Roll. Price/Roll.